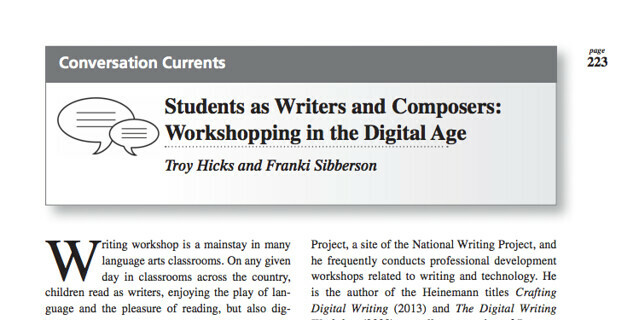 I finally got around to coming back to an interview with two of my favorite people — Franki Sibberson and Troy Hicks — as they sat down for an interview for Language Arts to talk about Digital Writing Workshop. (You can access the article as a PDF at the National Writing Project site). There are a lot of great insights and honesty in their conversation, and as I sought to reach closer, I started to grab some quotes from the text in order to pull them out for further thinking. 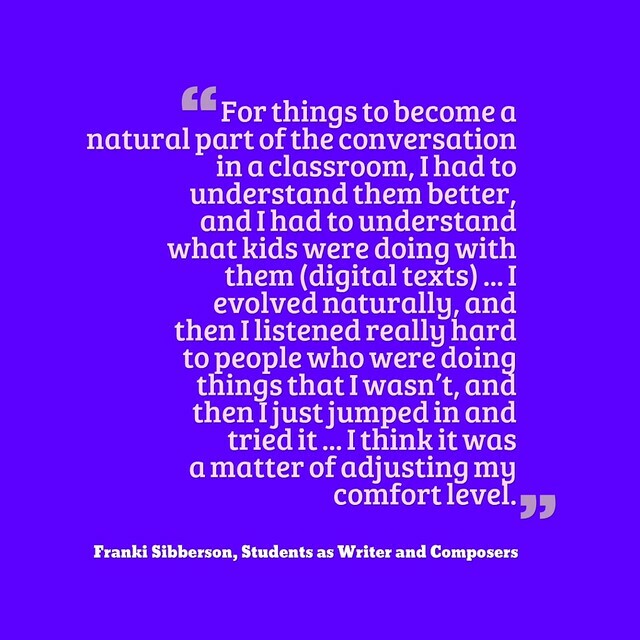 I was nodding my head here, because, like Franki, I hope I stay in tune with my students and their interests when it comes to thinking of ways that technology and digital platforms might push their own writing and compositional strategies further along. I’d also add that, along with listening, we teachers need be doing the technology, too. Snapchat, Pokemon Go, and others are unknown terrain unless you try them yourself. You might decide, this does not have application for my classroom (for now). At least, you will know from the experience. 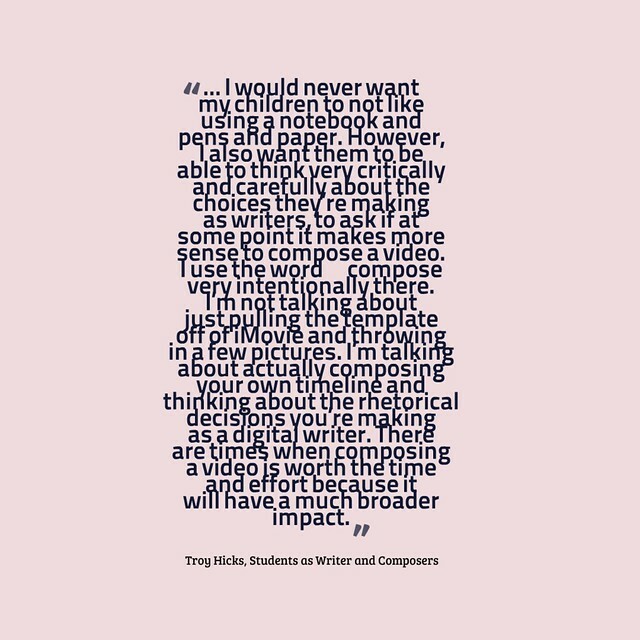 I like Troy’s point here, that the technology should have a rationale or basis for use in composing. He uses a heuristic called MAPS (mode (genre), media, audience, purpose, situation), which is very helpful in this regard, as it allows teachers to consider such things as audience and intent. 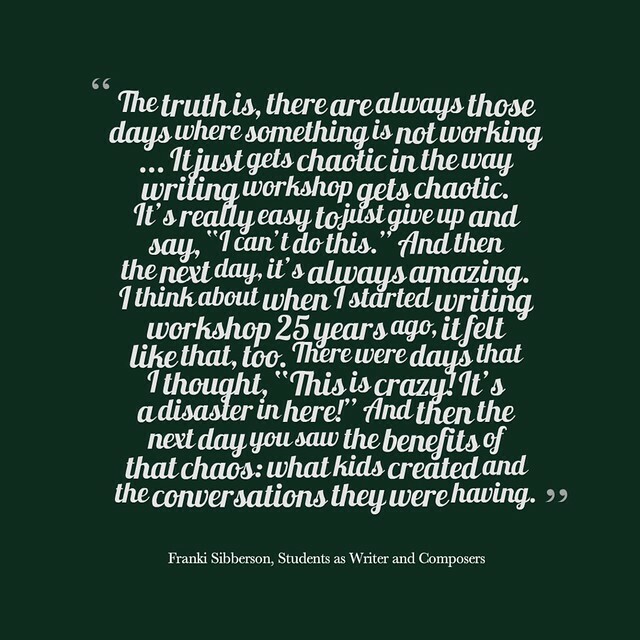 The technology is not just an engagement factor — it’s an intentional design of the classroom experience to help students explore writing in different angles, with different strategies, for different reasons. 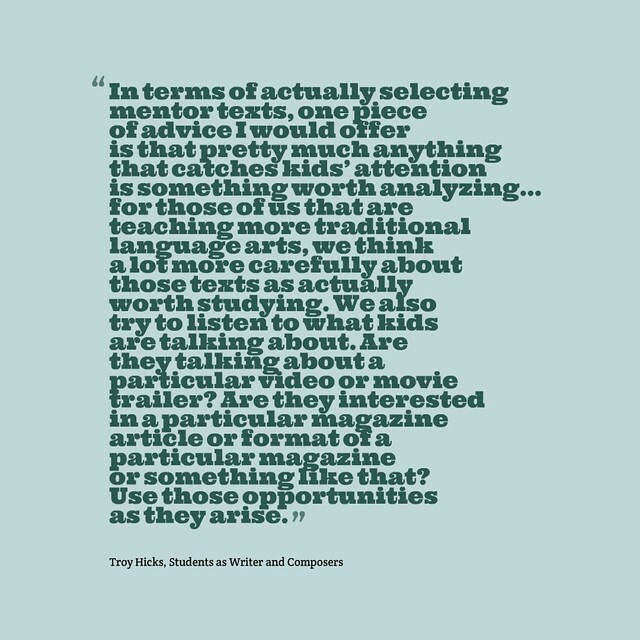 Here, Troy is talking about how to expand the notions of Mentor Texts by drawing from the world outside the classroom, from Pop Culture and beyond. Like Franki, Troy notes the importance of “listening” to students, to figure out where interest lies and then tap into that for learning. This is so true, and I have written at times about this, too. Some days, when we are moving into something new, things go awry, and the room is full of noise and seemingly chaos. I say, seemingly, because, as Franki notes, often amidst the chaos is some interesting reflections going on. Part of our role as teachers to find focus on the reflection (the process is more important than the product, most of the time) and draw that out, highlight it, make it the learning of the day. And keep calm. That same theme of analyzing process points is what Troy is discussing here, when the question of “How Do We Assess Digital Writing?” comes up. He notes how technology has the potential to uncover compositional strategies, and make a digital piece more accessible for comments and review and revision. If we can take our eyes off the final product and keep them attuned to all that goes into that work, we can assess learning in a more strategic way. Thanks to Troy and Franki for sharing their ideas. I found it useful and helpful, and I hope some of their words inspire you, too. This entry was posted in Digiwrimo, nwp, Technology Resources. Bookmark the permalink. Contrarian notes in the margins. Think of a crow cawing at the wind for ruffling his feathers.